Title changed from swarm prevention, to swarm management. Everyone has an occasional swarm. Prevention is not always possible, so we MANAGE our bees to reduce swarming as much as possible. Swarming is the GOAL of honeybees. It is their purpose in LIFE. Swarming is how they continue their existence, propagate the species and spread their genetics. Once they decide it is time to swarm it takes drastic measures to stop them, and often no matter what you do, they will swarm anyhow. So the idea is to catch them before they make that decision. I will go out on a limb here, and say, that a beekeeper who says he NEVER has a swarm, is most assuredly fibbing, or is completely unaware of the times his bees have swarmed. Many locations on the internet, and many books go into detail about swarm prevention and management. Some of those methods are simple, some are rather complicated. I believe the simpler the better. During swarm season, inspect the hive WELL at least every seven days. The bees will often swarm as soon as, or not long after the queen cells are capped. The queen cell is capped on day 8/9. The old queen often swarms not long after those cells are capped, so "IF" you miss a cell during an inspection, it is probable that your hive will swarm before you do the next inspection. It is a good emphasis on checking the hives weekly to help prevent swarming. Had I checked that hive the week before I would have seen the swarm cells being started and could have taken preventative measures. DO NOT, destroy queen cells when you find them. I do not advocate trying to stop a swarm with this method. There is too much that can go wrong. Usually, the bees will swarm even if you destroy all of the queen cells. If you miss ONE hidden in a depression in the comb, covered with bees, they are guaranteed to swarm. Often cells are destroyed, but the hive has already swarmed, so your bees are now hopelessly queenless. Many times, destroying all but ONE queen cell means the bees swarm when THAT virgin emerges, leaving your hive queenless, with no way to raise a new queen. Destroying queen cells will not stop swarming in most cases. Once they decide to swarm, it is hard to change their minds. Think of your wife who has been making plans to go on an extended vacation, a two week ocean cruise, and then think of trying to keep her from going the day before it is supposed to happen. In the picture below, there are two queen cells. One of them already has the wax on the bottom chewed away to make ready for the new queen to emerge. IF you destroy these cells, you are HIGHLY likely to leave these bees hopelessly queenless. My method is more interception than prevention. I will artificially swarm them with the old queen, and put a new queen in the production hive. "I" am the one that decides, rather than the bees. This allows me to limit the loss so my hives are still strong for production. So you have queen cells. Now what? You have quite a few options, I am going to explain what I do. As already stated, I swarm them myself. A small split, two or three frames of brood, a frame of nectar/honey, and a frame of pollen. A drawn comb if I have one, an empty frame if I don't. An extra shake of bees into a nuc or new hive box, and the OLD queen. IF there are queen cells on the frame the queen is on, .. it , or they will need to be destroyed. Feed this nuc, as it has few if any foragers. Reduce the entrance, and put a screen or other block on it to stop any would be robber from zipping into the hive. (Not blocking entrance, just stopping direct flight path into the hive) They have no guard bees yet. Place where you want it to go. I usually set it on top of the hive I intend to move them to as they begin to build up. In the old hive, there will usually be anywhere from four to a dozen queen cells. I destroy all but two of those cells. (Or use them in other nuc's if I liked the queen they came from) The idea is to stop after swarms. Virgin queens will usually fight. But there are times that they do not, and if they do not fight, one of them will leave with more bees. Then why not leave ONE cell? What if the cell you choose does not emerge? I have opened queen cells that did not emerge, and found the queen fully developed in the cell... UPSIDE DOWN. She never had a chance. Leaving two cells raises the odds that one of them will emerge. Two cells reduces the chance of after swarm. If BOTH emerge, there is a very high likelihood they will fight, and only one will survive. If one queen emerges before the other, the first emerged virgin is very likely to kill her rival before she emerges. This is about calculating the odds. With five or six queen cells emerging it is much more likely that there will be after swarms, or casts. We are trying to reduce the chances of that happening, yet still trying to make SURE this hive will have a queen. Yes, it is still possible that leaving TWO viable cells will cause a swarm. Open the brood nest, add supers, make sure you have adequate ventilation. Give the bees reason to stay. Give the new queens something valuable to fight over. At this point, you have done all you can. If they do not swarm, pat yourself on the back. If they do.. pat yourself on the back anyhow, because you did all humanly possible. "Wouldn't it be better to put the queen cells into the nuc?" When bees swarm the old queen leaves with the first swarm, and this is what I am trying to replicate. I want them to FEEL like they swarmed without reducing the population in the hive as much as an actual swarm would have. 1. They DO feel like they have swarmed. 2. The hive gets a brood break. This breaks the Varroa breeding cycle. 3. With no new eggs and larvae, they will begin to build up a surplus of honey while they wait for the new queen to emerge and get mated. 4. I have removed a minimum of bees leaving the main hive strong for production. If they have charged cells, they are in swarm mode, and removing the old queen is the most convincing way to quell further desire to swarm. Leaving the OLD queen in the hive may not convince them that their job is done. OR, they may swarm no matter what you do. I have split a hive into 4 nuc's with extra bees for each nuc. Depleting the original hive numbers to the point that they were nothing more than a nuc as well, I left them a single queen cell, knowing I could combine one of the other nucs if the queen failed to mate, or failed to return.. Then watched them swarm three days later with that virgin queen, despite their lack of numbers, leaving what little remained of the parent hive too weak to rebuild, AND queenless. Removing the old queen is working WITH the bees, rather than against them. As with most things beekeeping, your trying to change the odds of something happening to favor what YOU want to happen. Playing the odds. So far I have talked about what to do if you find queen cells. It would be much preferred to do the split mentioned above BEFORE they decide to make those new queens. Thus preventing them from going into swarm mode entirely. Young queens have a stronger pheromone than older queens. This in itself inhibits swarming, but may not prevent it entirely, especially if they become overcrowded or congested. Overcrowding can be because there are a lot of bees, or it can be because the bees have filled the brood chamber with pollen and nectar, and the queen has limited space to lay. My own beliefs may not be accurate, but they have served me well, and so I will talk about them. Brood and queens have a scent, or Pheromone. I believe it is what convinces the bees in the hive of their future actions. Bees are also industrious. They want something to do. A LOT of bees standing around with nothing to do, will want to swarm. They want to go build a new house so they are employed. Make sense to you? It does to me. Even if scientifically inaccurate, those two beliefs have served me well. Keeping the brood chamber open, and keeping bees employed will often keep even a three year old queen from swarming. I have two queens that will be four this year. They will be split into nuc's, new queens put into their hives. 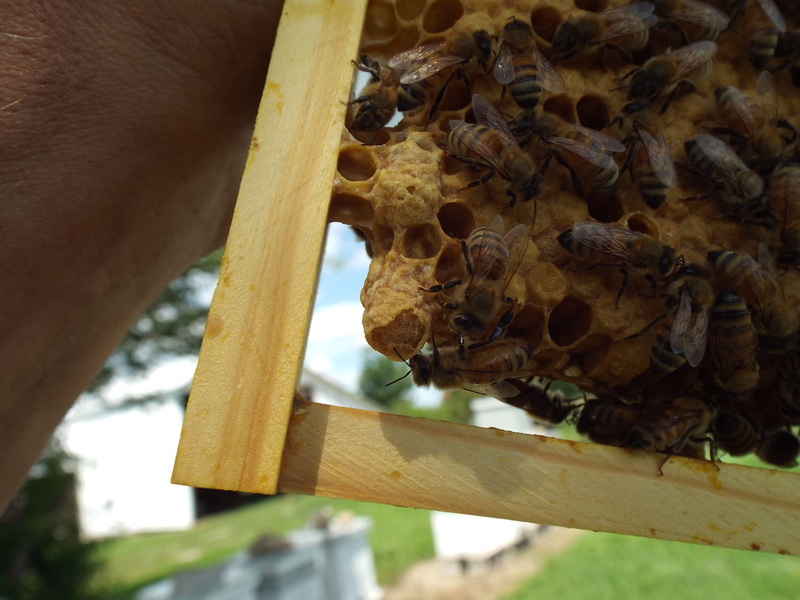 They will begin building up the nuc's, and in mid summer, when I can produce my own queens, they will be replaced. I have kept them from swarming by keeping their brood boxes open, and by keeping them employed. I know this, because I only have two queens that were marked. Both of those 4 year old queens still have the remnants of paint on their thorax. Keeping the brood box open, and keeping the bees employed. When build up begins, I reverse my boxes to put the cluster near the bottom. I put two or three empty frames in the new bottom box. Foundation-less frames. If you use foundation, do NOT split the brood chamber. Put the new frames on the outside edge of the brood chamber. If you use foundation-less, they can go directly into the center of the brood nest with a fully drawn frame between each of them. I put three or four empty frames in the second box, and the third box. I use the fully drawn frames I removed to start new colonies/nuc's. I have opened the brood chamber, and given the bees a job, in creating comb on those new frames. Supering ahead of the bees will also help keep the brood chamber open. It takes two boxes of nectar to make one box of honey. If you do not have enough supers on the hive, they will store nectar in the brood chamber, reducing the availability of cells the queen can put her eggs in. Stay two supers ahead of the bees at all times. Don't wait until you think a flow is starting. As soon as the weather begins to allow them out and about, put two supers on. As those begin to fill with Nectar, put two more on. Note; If your supers are not Drawn, then only put ONE on at a time and let the bees get at least seven of the frames drawn before adding another. When I have a booming colony, I will often take frames of brood and put those frames in colonies that are not as strong. I may even reverse the location of the hives so that the foragers from the strong hive return to the weak hive. This allows my production colonies to build up at a similar level. Reasons for one hive being weak, and what to do about it will be a topic for a different page. The effect is to slow the growth of the booming colony and reduce the tendency to swarm, while strengthening the weaker colonies, WITHOUT removing too many bees and reducing the potential to make honey. Michael Palmer claims that removing bees/brood weakens the hive irregardless of how few are removed.. I agree completely! However, I also draw a line at possible swarming. I would rather have them SLIGHTLY weaker and comfortable, than have them swarm. What if you have three or four hives, and that's ALL you want? Keeping two or three nuc's is still a good idea.. barring that? Do the artificial swarm. Let the old hive produce their queen. Give them the brood break, and let them put up honey while they wait for new brood to feed. Then pinch whichever queen you like the least. Wait 12 hours and re combine the bees from the artificial swarm using the newspaper combine method. Be prepared to uncap brood. Just like uncapping a frame of honey. As your hive population begins to grow, stay ahead of them. One frame of capped brood has enough bees to cover TWO frames once they emerge. When your hive is strong, take your uncapping knife, or just an old filet knife. Heat it up in scalding water, and uncap frames of brood. It is ugly, and it is messy. If your hive has 12 frames of capped brood.. uncap three or four frames as mentioned above, and put those frames directly back into the hive. The bees will begin to remove the dead pupae, and clean/repair the cells in preparation for the queen to lay in them again. You have just employed a LOT of bees, while also reducing the future population to manageable levels. You may have to do this two, or maybe even three times through the spring to keep the hive from swarming. As you can guess, this would not be my preferred way to prevent swarming. I would much prefer to make the nuc's. Sell some, overwinter some, replace my losses with them, and sell the rest, then make up more as necessity dictates. In effect, clipping a queens wing so she cannot fly, or cannot fly well. In the event of a swarm, she WILL leave the hive. Depending on the clip, she may be able to fly, but will not be able to go far. She may also simply fall to the ground. If she can fly, she may make it to a nearby branch or other structure where the bees will cluster around her, giving you a chance to collect them. In the worst case, they will leave their location and try to move to the home they have selected.. the queen will not make it. They can often be found anywhere from twenty to a hundred yards away. Usually on the ground with the bees clustered around her. In the event she cannot fly at all, she will be found on the ground in front of the hive.. again, often with the bees clustered around her. Usually.. you can recover them, provided you didnt walk over to check the hive and step on her, OR, she was capable of flying far enough that you cant locate where she ended up. When a queen falls to the ground, perhaps you do not notice right away. Eventually the bees will give up on this unworthy queen and return to the hive. Problem solved right? They will patiently await the first virgin to emerge, and they will swarm with her. If you destroyed all of the queen cells but one, you will be left with a queenless depleted hive. I prefer not to clip. I live in the country. A swarm is not a threat to the local populace. If my methods fail, and my bees swarm. I would prefer she had the best chance possible. I have not tried any of the more complicated methods. With the methods I have used I have achieved pretty good success, so I have seen no reason to buy/build a Horsley board etc.. Using queen excluder on the bottom board and top of the brood chamber does obviously preclude a queen from flying with a swarm. They may try to swarm several times, the problem I see with this is, that you have to open the hive some time. The queen is slimmed down and in flying trim. Will she now fit through the excluder? If not, she may well make good her escape when you open the hive. A queen excluder works well for keeping a swarm queen in her new home, or as a filter to FIND a queen. I would have my doubts about using it as a swarm preventative used by itself. Using it in conjunction with another method may be more effective. Cutting out all cells, opening the brood chamber and adding supers, then installing excluders above and below the brood nest would have some merit. If they do try to swarm, they will quickly return to the hive when the queen does not join them. If you miss a cell, and the virgin queen CAN fit through the excluder, they will swarm with her. If she cannot fit through the excluder, she will likely kill the older queen and be unable to leave to go on mating flights. Remove the excluder so she can, and they may well swarm with her. Open the brood chamber with new empty frames to employ the bees. Keep supers ahead of their needs, added to the hive. with top notch genetics, or queens selected/raised from my best hives. A lot of information to be found. Do a search for Swarm Management, and don't forget to sift the gold from the sand. A quick update here to show how determined some genetic lines can be. We have a wonderful Lady on the WWB Forums that had her bees swarm on her early this spring. So we all gave our best advice, and were content with her actions taken to remedy the situation. She only wanted two hives, so this saved her from splitting. She went into the old hive, and removed all but two queen cells.. Perfect. Those bees swarmed again, and again, and again.. to date she has had ten swarms, two of them issuing from the NEW hive that swarmed. We did finally convince her to order new queens for her hives. In going through her hives to re queen them, she pulled 20 Plus queen cells from the old hive. This was a hive with a newly mated queen they raised themselves. From the timing of the swarms, I would have to guess that the day the newly mated queen started laying, they started making more queens. Swarmy behavior like this is intolerable and goes to show that it IS possible to breed for bees that swarm prolifically. I believe this hive would have swarmed itself to death. In the prime swarm season, check your hives every seven days, and take the actions necessary to prevent swarming. None of us can predict the behavior of the bees with complete confidence. In this case, she made sure they were not crowded. They had extra boxes and frames. They had frames to draw, and they had a good flow. They had a new queen that has an amazing brood pattern, and yet they had 20+ Queen cells built. Be vigilant! Before I close.. I want to reiterate that EVERYONE has swarms once in a while.. It has come to be understood, that a beekeeper, whos bees swarm, must be a very poor beekeeper... I have heard this said MANY times, and I am going to completely refute this statement. It is totaly false, and misleading.. In todays world, with Varroa, CCD, Two Nosema varieties, Foulbrood, Chalk brood, Wax Moth, Hive beetles, Systemic pesticides, other viruses like DWV, Changing and unpredictable weather, etc, etc, etc.... If your hives SWARM, that tells me that there is a beekeeper that is doing something RIGHT!!! He, or she, has to have STRONG HEALTHY bees for them to reach the point that they will swarm.. sick bees, stressed bees, etc, are NOT prone to swarming.. So, when you miss that ONE queen cell and your bees do swarm.. Just bend your arm around and pat yourself on the back, because your doing OK!!! !